Ch4 22 – My Hero! I know what you’re thinking. Sazael should be far more concerned with everything going on right now. Due to side project, no review this week either. I promise to get one for next week. Things have just been a little hectic. I’m half expecting Lark to wake up with just a small hangover from however much cyanide that is… maybe be a bit gassy. How many has he had, then? Has he been spacing them out with water? Ulp. The hangover alone will… oh, wait, this this is still live. Errr, well, as I was saying… I’m sure Hasera has got this, no problem. You go, girl! You know the saying: Counteract a poison with another poison! That just means he’s got to drink enough alcohol for his alcohol/blood content to be around 1.0. Then it would be impossible for the poison to kill him! Earlier he was complaining that he had too much blood in his alcohol stream! And we all know that not having enough booze in his system was the worst thing Lark could imagine at that time. Well we all know he isn’t dead because otherwise this would be a short story however the other champions that is another matter entirely. Well, he’s dead drunk. And passed out, dead to the world. Biggest possible twist I can imagine is for Lark to be actually dead and Hasera just taking his place making her the sole MC. But then you would have to update the banner at the top of the website. What if she was haunted by the Unclaimed version of Lark whose sole regret keeping him from moving on is that he didn’t get to bang Hasera? I mean, that would be a twist and it would be easy to just change Lark’s skin tone and put one of Cindrani’s marking on his face and wham, new banner! I hate to say this, but I’m seeing some sort of visual inconsistency between this page and the previous page. The angle at which Sazael descends does not appear to be consistent with the angle of the main force of the explosion that propelled him. Also, how is Hasera ahead of him, if he got propelled toward the temple where the Champions were drinking? The longer Sazael was in the air, the higher he had to have been pushed by the explosion, making the angle of its main force even more inconsistent. One way out of part of the preceding problem is to geographically place the temple at a lower altitude than the inn –but then there is a sociological problem, since temples often get placed on higher ground than other municipal structures (although that can depend on the deity). There would remain the issue of how Hasera got ahead of Sazael. Well, to be honest, nowhere does it state the amount of time between the shots. The easiest explanation is just an expansion or removal of invalid or useless scenes that would portray Hasera running past the downed Abyssal. We drafted this one a few times and it didn’t add anything to the scene other than just showing Hasera running towards the temple, so it was opted to just go with Hasera running towards the temple with Sazael watching on from his spot against a column. Well, if Sazael just stood there and waited for to see what Hasera did next (conveniently she ran right nearby, heading toward the temple), but his job is to kill her, why isn’t he still trying to do that? Is he that sure he hasn’t got a chance to win? Try this. In the previous comic, he was knocked horizontally through the wall with great force. While panel one shows him coming down from a height. Maybe it was enough force that he has ricocheted off the ground, and up into the air. We see him coming down but at an angle, so most of the momentum is still horizontal. Now he knows what a tennis ball feels like! On page 10 of this chapter it is stated that this temple is dedicated to Jer’zail, the god of Strength and of the Abyssals. It could very well be proper for his temples to be at lower altitude than other structures, and makes for a very simple solution to the path of Sazael’s toss through the air. By the way, Jim, in looking through the story for information about Jer’zail, I happened to see that chapter 2 page 18 describes Guardian garb as a “tabard”. You might want that changed to “surcoat”, since it was changed on another page recently. Will do, thank you for the attention to detail! Typo: should be “ail what cures you”, not “ale”. That’s the joke :D. Crossbones Ale – get it? yes, but the second “ale” should be “ail”. It’s like their slogan. It’s a pun. After which Zazael gets pummeled with a beer mug! Meanwhile Hass takes bets on how many hits will it take to get to the center of a minion. Rule #2: Always kill the Healer FIRST! Basic knowledge. What I want to know is why does the academy not teach the “Guardians” how to use offensive magic? Best way to make sure an enemy doesn’t kill your charge is to kill the enemy first. World has been at peace for far too long if this basic doctrine has been forgotten. It’s possible that there’s some incompatibility in the magic types that means that learning offensive magic makes it harder, or even impossible, to learn the standard Guardian magic. 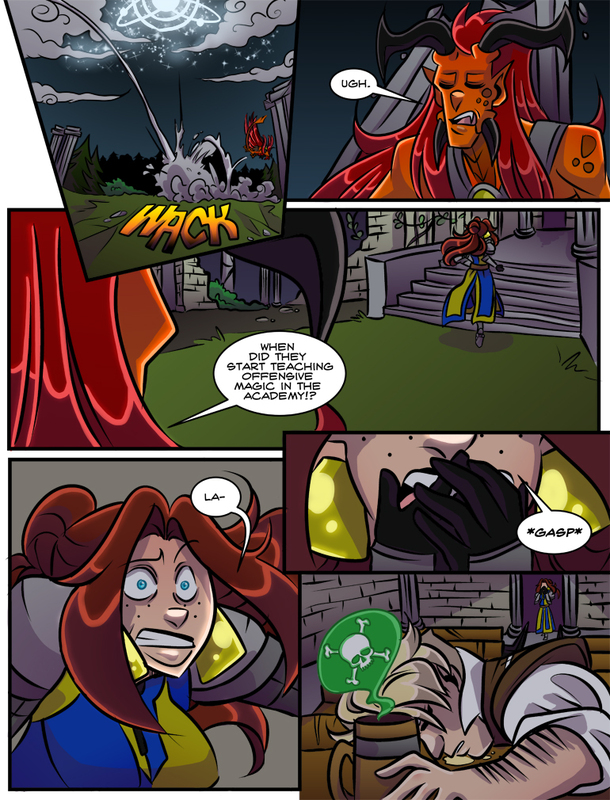 After all, Hass pretty much doesn’t have ANY of the magic that Guardians normally use, despite otherwise seeming to be fairly capable (if inexperienced) – it’s possible that this is due to the magic she DOES have overriding it somehow.